We recently had the chance to catch up with Naomi Stuart, founder of FARMPay and alumni from our first SheStarts program! Since the conclusion of SheStarts, Naomi has been moving from strength to strength within the startup ecosystem. She has just returned from a startup mission organised by the NSW Government in Tel Aviv, Israel, followed by a trip to China sponsored by the Sydney School of Entrepreneurship. We sat down with Naomi to talk about her recent experiences and where she’s headed next. As one of ten fintech and cybertech startups chosen by the NSW Government and AusTrade to head to “Silicon Wadi”, Tel Aviv, we were fortunate to have the minister for innovation, Minister Matt Keen, join the team for part of the stay. The delegation, which was based in SOSA, a co-working space and innovation hub, allowed us to connect directly with startups in the local ecosystem. For the duration of the trip we were given the opportunity to work closely with mentors who were able to provide guidance on how to continue to build and scale our startups. Finally, the trip was capped off by the DLD Innovation Festival which ran over two days in Tel Aviv. The festival gave us access to VCs, startups, not just from Israel, but globally. The most surprising aspect of the trip was realising the scale of the startup ecosystem in Israel. For a country that is relatively small in size and population, at just 8.4 million people, they have the most startups per capita in the world. Additionally from the moment a startup begins in Israel, they are global from day one. Being able to “think global” from day one was an important lesson for startups everywhere and particularly for Australia, as we’re relatively small on the global stage. Another aspect where Israeli startups stood out is their willingness to collaborate and share within the ecosystem – including their willingness to partner with FARMPay. Through this trip, we’ve made a number of connections with companies we may look to work with in the future and have already commenced following up. The companies that we’ve connected with excel in areas such as blockchain and AI. Certainly in Australia we are seeing startups share and collaborate more but what I’d like see fostered is a mentality where Australian startups don’t see each other as competition and start to want to work together. 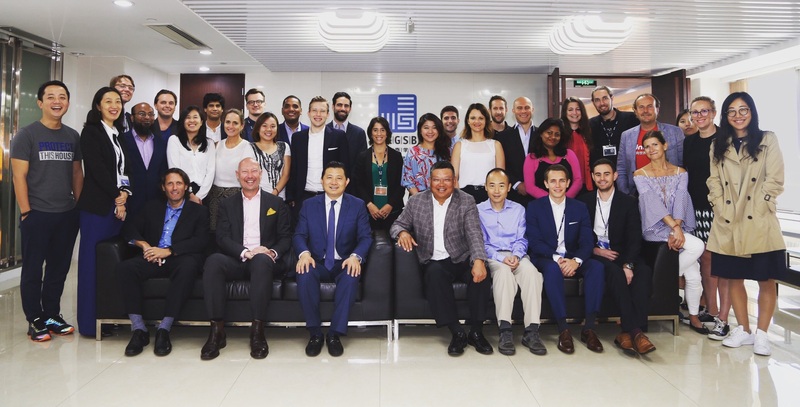 FARMPay were also fortunate enough to spend five days in China as part of the ChinaStarts program sponsored by the Sydney School of Entrepreneurship. The program took us from Beijing to Shanghai to Shenzhen where we delivered five pitch events in five days and connected with VCs. Simultaneously, we also heard from Chinese thought leaders in the innovation space and more importantly about how to do business in China. Part of our desire to travel to China as part of ChinaStarts was to understand the agricultural landscape and ecosystem on such a large scale. Over the trip we were able to connect with senior people within the agricultural sector who were able to share with us some real insights into the agriculture ecosystem and also connect us with the right people to help us succeed and grow in China. It’s incredibly important to physically meet with potential Chinese partners so they are able to get to know you and understand your business before fostering and developing that relationship further. We’ve been able to succeed and grow due to a number of factors and that’s firstly due to a good support network. It’s enabled us to see the global picture for FARMPay and connected us with the right people to make it happen. SheStarts has the incredible ability to wrap all the support that you need around you to make sure you’ve got the best chance to succeed. You don’t need to be a technical founder and you don’t need to have been already connected to the entrepreneurial or startup ecosystem because SheStarts will provide you with all those tools and really give you the maximum chance of success. For those considering applying, my number one tip is to start with the problem. Make sure you’re solving a real-world problem that’s also scalable globally but also make sure you’ve got passion, drive and resilience – because you’ll need it. Ultimately the ability to take a risk and the passion we have for FARMPay, that we’re solving a real problem, is what has kept us going because we can see that we’re going to make a huge difference in the agricultural landscape. The wonderful thing about entrepreneurship and innovation in Australia is there are huge opportunities right now. The State and Federal governments are incredibly supportive of developing the ecosystem here in Australia and to allow startups to grow and prosper. So, if you’re willing to open your mind to the possibilities and willing to take that chance, there’s nothing stopping not only FARMPay, but also other Australian entrepreneurs. At the moment, we are focused on conducting our pilot on a farm in the next few weeks and delivering that successfully. From there we will be moving to raise a seed round. FARMPay has also recently be accepted into the GrowLab Agtech accelerator by Cicada Innovations. With the foot on the accelerator we are so excited about to see where Naomi will take FARMPay next. Follow her journey through FARMPay’s Facebook, Twitter and website. Make sure you head to our Facebook, Twitter or Instagram for all the info and news as we continue to follow the success of our founders and updates regarding the next cohort for SheStarts!